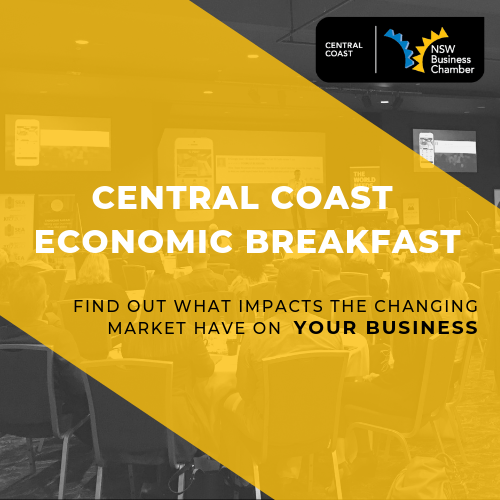 We invite you to join us for the Central Coast Economic Breakfast - with thanks to our Major Sponsor University of Newcastle, Central Coast. The scope of this event is to bring together all business and key government stakeholders in the region for an Economic Update covering global, national, regional and local economic activity, data and projections. We will also hear from Central Coast Council, who will provide an update on planned projects in our region. Find out what impacts and opportunities the changing market has on your business decisions relating to employment, investment and expansion. Join us for this informative breakfast. Corporate tables of 8 are available to bring along your staff, colleagues or clients!